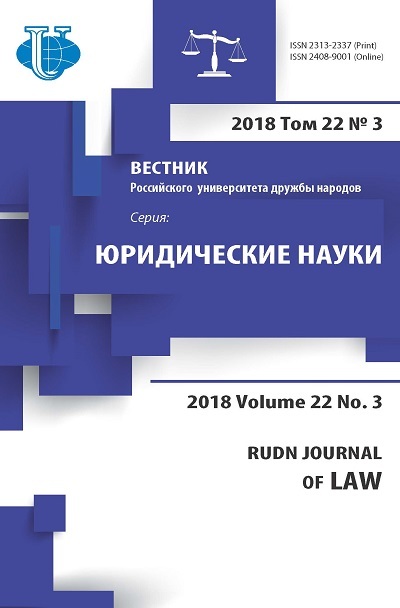 Analysis of customary law in different countries enables to see cultural context of law and by that it gives the opportunity to define character of national legal system. Different peoples’ customary rules of law are formed as a result of long-term accumulation of legal regulation experience. Value of customary law is that it was established free from some political and ideological conjuncture. Research of Abkhazian adats leads to conclusion that social order depends on balance of regulative processes consisting of external organisation by public institute of the state and internal self-organisation of the socium. The author analyses Abkhazian customary law that still plays important role in development dynamics of the social system because in customary legal consciousness the principle «that way was usual (always) in the past» is a necessary condition for regulation of important things. It is the custom that helps to juridify social relations because it has authority of rule of conduct approved by the time. That is why the author suggests paying attention to criteria of “justiciability” delimiting legal and non-legal in social regulation. She defines a list of attributes differentiating the custom without legal significance and customary rules of law that fulfill legal criteria. From this point of view Abkhazian customary law: 1) is normative one; 2) is statutory one; 3) is rational one, it provides integration (i.e. oriented to interests of bigger social entire); 4) has an attribute of goal-setting; 5) regulates the most important things; 6) is processual one; 7) is provided with sanctions and provides contribution. The author resumes modern Abkhazian positive law itself is unable to meet the challenges of legal regulation and establish the legal order. It is necessary to use the opportunities of customary legal juridification of social relations because in modern Abkhazia it can provide development of legal system by fortifying state legal institutes’ credibility. cultural context, public order, customary law, usually legal form of thinking, criteria of «justiciability», Abkhazian legal system. Friedman LM. American Law: An Introduction. New York: Norton; 1984. xii, 362 p. [Rus.ed. Friedman LM. Vvedenie v amerikanskoe pravo. Moscow: Izdatel'skaya gruppa “Progress”; 1992. 286 p.]. Carbonnier J. Sociologie juridique. Paris: Librairie Armand Colin; 1972. 320 p. (In French). [Rus. ed. Carbonnier J. Yuridicheskaya sotsiologiya [Juridical Sociology] Moscow: Progress; 1986. 352 p.]. Malinowski B. Magic, Science and Religion and Other Essays. Boston, Massachusetts: Beacon Press; 1948. 327 p. [Rus. ed. Malinowski B. Magiya, nauka i religiya. Moscow: ''Refl-buk''; 1998. 304 p.]. Lloid D. The Idea of Law. Harmondsworth: Penguin; 1974. 368 p. [Rus. ed. Lloid D. Ideya prava. Moscow: YuGONA; 2002. 416 p.]. Kharaniya VL. Slovar' yuridicheskikh terminov (russko-abkhazskii, abkhazsko-russkii) [Dictionary of legal terms (Russian-Abkhazian, Abkhaz-Russian)]. Suxum: Alashara; 2002. 158 p.
Berman HJ. Law and Revolution: The Formation of the Western Legal Tradition. Cambridge, Mass. : Harvard University Press; 1983. x, 657 p. [Rus. ed. Berman HJ. Zapadnaya traditsiya prava: epokha formirovaniya. Moscow: MGU Publ., Norma; 1998. 624 p.]. Copyright (c) 2017 Kamkiya F.G.